Consumers Union, the advocacy arm of Consumer Reports, commended the Vermont House of Representatives for today’s historic vote passing H-112, requiring the labeling of all genetically engineered (GE) food sold in that state, by an overwhelming margin of 99 to 42. The bill now moves to the Vermont Senate, which will take it up when the legislature returns January 2014. If the Senate passes the bill, Vermont will be the first in the nation to mandate GE labeling. The Vermont House is the first state legislative body to pass a bill to label GE food, although the state of Alaska passed legislation requiring labeling of GE fish. GE food is required to be labeled in 62 foreign countries, including all of the European Union, Japan, Korea, Australia, and India. The Vermont bill will go into effect when two other states have passed similar legislation, or within two years from the date of signing. Labeling bills are also pending in Maine, Connecticut, and several other states. “All these states will be hard fought,” said Hansen. A ballot initiative in California lost in November 2012 by a small margin, 51 to 49 percent. Industry opponents outspent supporters by roughly five to one. A similar GE labeling initiative will be on the ballot in WashingtonState in November 2013. A federal bill to require GE food labeling was recently introduced by Senator Barbara Boxer (D-CA) and Representative Peter DeFazio (D-OR). Interest in labeling bills has increased since the U.S. Food and Drug Administration (FDA) completed the final steps of its approval process for GE salmon this year. 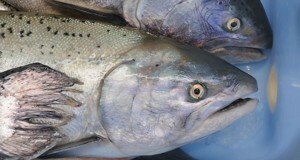 If approved, the salmon would be the first GE animal on the U.S. market and the FDA has said that it does not intend to require labeling of it. Nearly 2 million people recently told the FDA that they oppose approval of GE salmon. H-112 would also require the labeling of GE salmon. Consumers Union has long supported labeling of GE food and stricter regulatory oversight of GE crops.